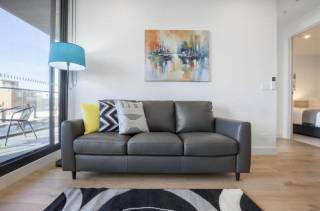 Completely renovated, 3 bedroom 2 bathroom, fully furnished unit in Sandringham, Victoria. 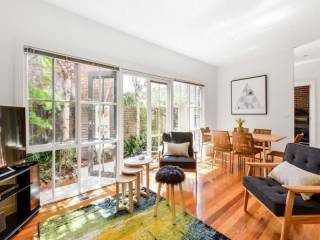 Quality, 4 star, pet friendly accommodation in the heart of the popular bayside village of Sandringham only 5 minutes walk to the beach, cafes, and public transport. Sandy Haven A offers 3 ½ star standard 3 bedroom 1 bathroom accommodation in a quiet street just 2 blocks from the beach, providing clean and comfortable accommodation for the more budget conscious. When you open the front door you will find a good sized open plan layout including living / dining and a family sized, fully equipped kitchen with very generous drawer and cupboard space. There is also a concealed European laundry with washer, dryer and sink for your convenience. You also have complimentary ADSL wireless internet connection, a wide screen TV, DVD player and mini stereo/CD system. The Foxtel Standard package is included for your viewing pleasure including 30 channels across sport, entertainment, news, documentaries and movies. The main bedroom has a queen size bed and the second and third bedrooms have king beds which can be split to single beds as required. All bedrooms have built in robes. The bathroom is small but clean and functional with shower over bath, single vanity and separate toilet. There is ducted air conditioning and heating throughout and a large hot water system, providing hot showers for everyone. 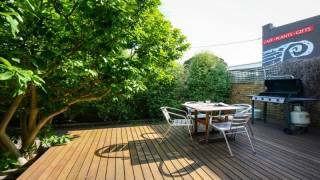 Outside there is a secure back courtyard where pets can roam safely, while in the front there is a sunny garden with table and chairs for relaxed meals cooked on a gas barbecue. Off-street parking is provided for one vehicle with plenty of parking available on the street for additional vehicles. This self contained villa would suit a budget conscious family requiring short term accommodation in Melbourne and is ideal for those wanting to relocate to Australia. 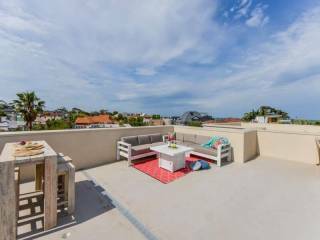 Sandy Haven A is also ideal short stay holiday accommodation for your next visit to Melbourne as it is only 2 blocks away from the beach. We now have 2 properties at the same address; Sandy Haven A and Sandy Haven C, which is a 4 star property with 3 bedrooms and 2 bathrooms. These properties provide unique flexibility for 2 families wanting to be close to each other whilst retaining their own space. Alternatively, either property on its own provides very comfortable accommodation.